Window Clings is rated 4.4 out of 5 by 5. Rated 5 out of 5 by David777 from Look good Just putting them up. So far so good. I'll keep you posted. Rated 5 out of 5 by pulcher from Nice work and looks way better than I expected. Really suprised at the speed of creation and the help to get things in progress. Rated 5 out of 5 by mfjames from great products! great service and products. Haven't used anyone else for the last two years! Custom window cling printing can make branding and designing on glass and similar surfaces simple and straightforward. Custom printed window clings require no adhesives, tacks, or any other tools. The opaque static cling material easily adheres to glass and other smooth surfaces through suction and is easily removable. As no adhesives or additional materials are required, custom printed window clings will not leave unsightly residue on your storefront windows. All window clings come with an opaque background, making it easier to see your design on transparent surfaces. Need window cling printing? Fill out our custom order form or give us a call. All text and images will be opaque and easier to read. The background will remain transparent. Only the text, images and background that are white will be transparent. All other design elements will be opaque. The entire sticker will be transparent. Not ideal for stickers with small text. Choose this option if you have set up your file with the correct transparency and HPT-White layers. We will print as is. 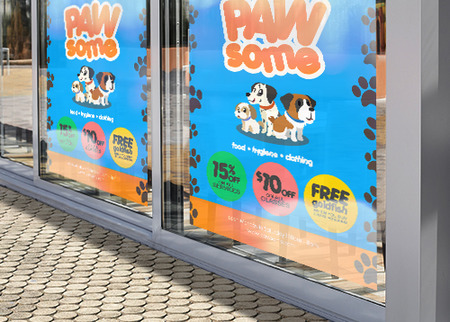 Use our window cling layout templates so your artwork and designs are sized and formatted perfectly for your storefront. 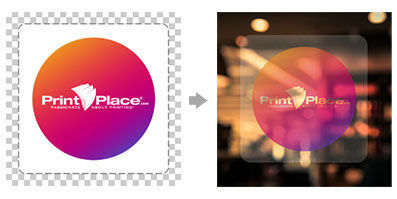 PrintPlace.com layout templates can be downloaded for each window cling size below, in different popular formats. If you have a brick and mortar store or office with a glass front, custom window clings should be considered a necessity for any storefront. Blank windows on your store are opportunities for either advertising, or for giving your place of business a specific look. Since window clings are easy to apply and leave no messy residue, they can also be used for temporary offers and decorations as well as for long term signage and branding purposes. They are an easy, cost-effective way to update your store's look each season to create excitement and freshness in your offers. The quick order turnaround times and ease of installation make window cling printing ideal for all kinds of promotions, even at short notice. Use them to promote sales, new product offers, and even special events. Window clings can also be customized and attached to car windows. Place them in a safe area that won’t block the driver's view, and you have a mobile, removable advertisement for your delivery or service vehicles. They’re not just for stores either. Event organizers will appreciate the flexibility and simplicity window clings offer. Any public area with store windows is a potential space for promoting any event. Contact our friendly print experts to print window clings today.